This code will illustrate the R package (DTVEM) with simulated data available in the DTVEM package. Click here to download and install the DTVEM package. First load the DTVEM package. 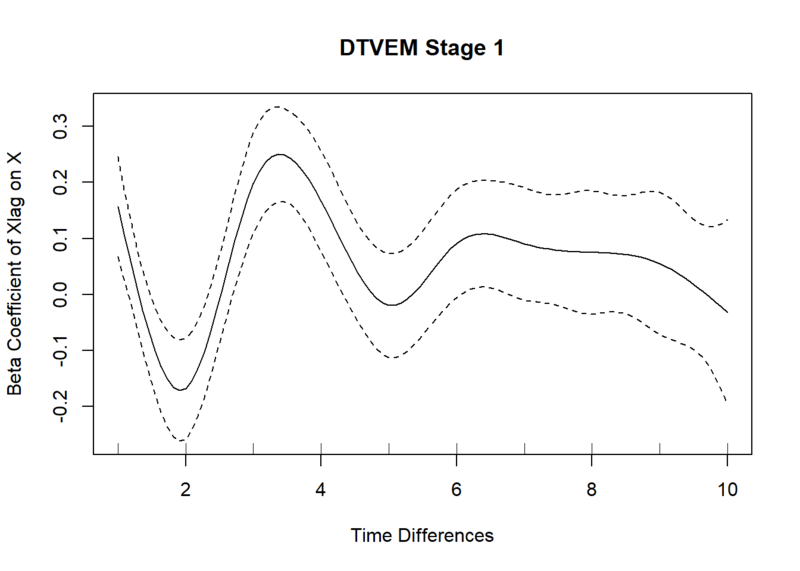 Next load the simulated data included in the DTVEM package, called exampledat1. Get a look at the file structure. 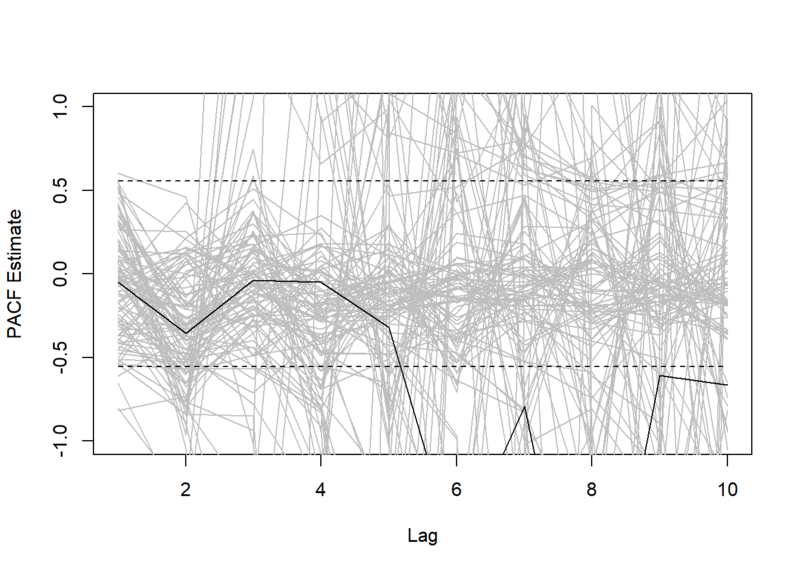 Next we want to explore lags with typical time series techniques. Run a partial autocorrelation function for the variable for each ID. Okay, we have the results, now we have to plot them. Each grey line will represent a PACF estimate for a given individual. The black lines will represent the mean PACF estimate. The results look like for any given individual the PACF results are highly unreliable. However, the PACF does suggest that there are potentially significantly negative lags at lag 6, 7, 8, 9, and 10. Let’s see what DTVEM has to say about this. ## Setting up the data for variable #1 of 1. 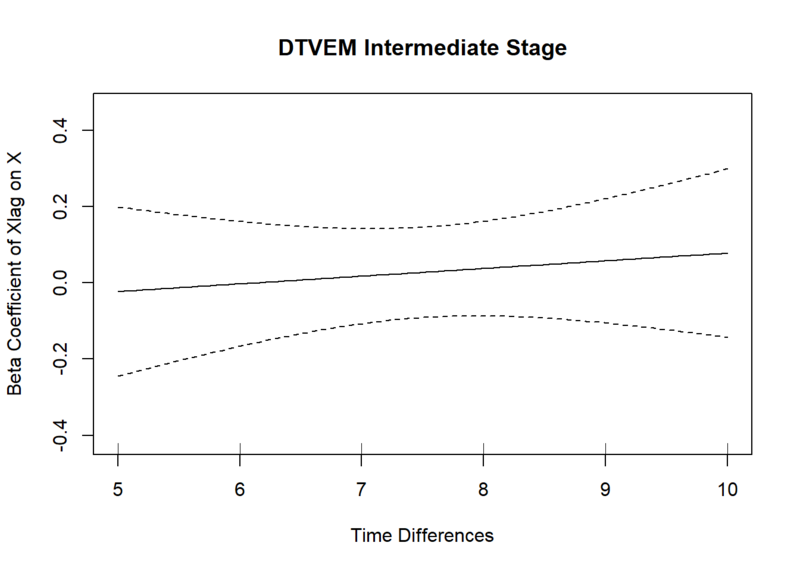 ## Completed stage 1 of DTVEM, now identifying the significant peaks/valleys. ##  "Variables that should be controlled for are: XlagonXlag1"
##  "Variables that should be controlled for are: XlagonXlag2"
##  "Variables that should be controlled for are: XlagonXlag3"
## Contact the author - Nick Jacobson: njacobson88@gmail.com if you have any questions. Unlike the PACF, DTVEM identifies the correct lag structure, which is based on true positive lags at lag 1, true negative lags at lag 2, and true positive lags at lag 3. 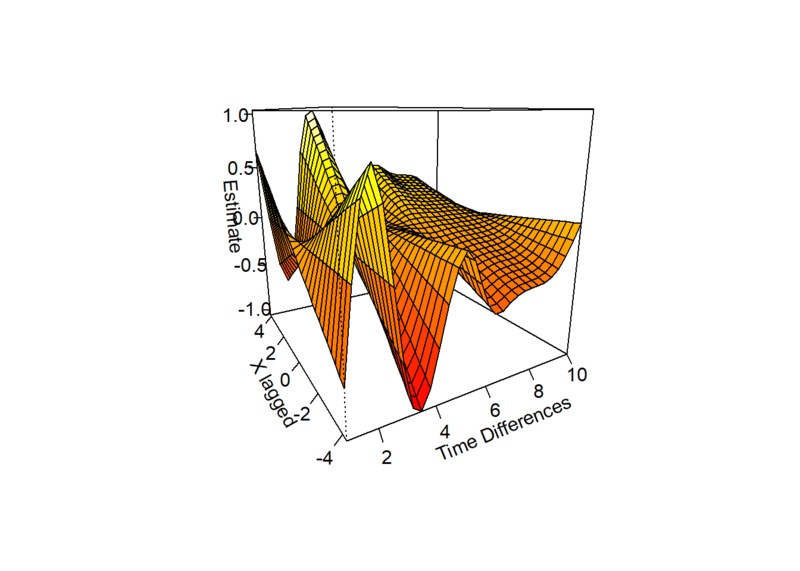 Let’s plot the 3-Dimensional 1st phase of the results as an illustration. library(mgcv) #MGCV is used to plot the vary-coefficient model in stage 1. This clearly shows a positive lag at 1, a negative lag at 2, and a positive lag at 3. So, X predicts significantly itself positively 1 lag later, negatively 2 hours later, and positively again 3 hours later.